Sunshine and bright colors have been in short supply during the month of November. We have already broken the all-time record for rainfall in November in our area and will break the record for rainfall in a year if we have one more inch (25mm) of rain by 31 December. 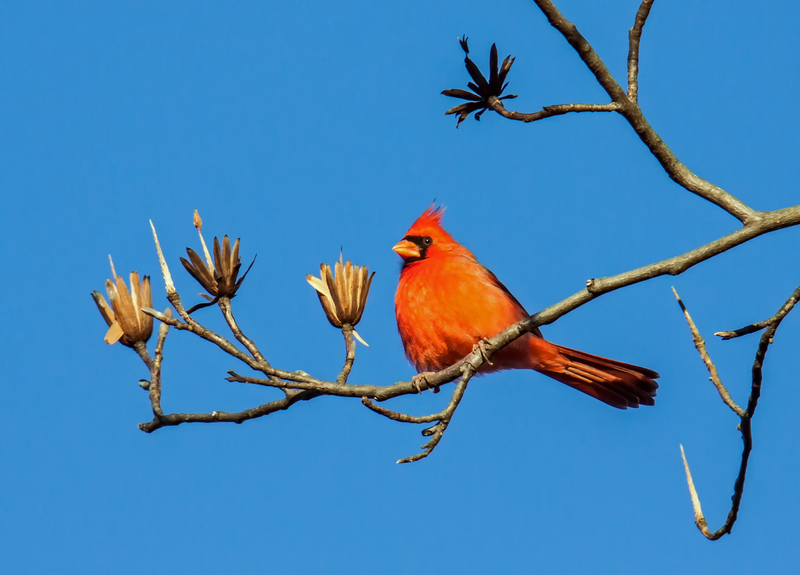 I was therefore absolutely thrilled when I spotted this bright red male Northern Cardinal (Cardinalis cardinalis) high in a tree at Occoquan Bay National Wildlife Refuge earlier this week. Unlike so many other birds that try to blend in with their surroundings, the cardinal seems bold and self-assured—it is not at all hard to spot them, though they often bury themselves in the middle of bushes, so getting an unobstructed shot can be quite a challenge. Comparatively speaking, this cardinal was cooperative and posed for a short while before finally taking off. His head was in constant motion, but eventually I was able to capture an image with the head in a decent position. Even with human subjects, I find it tough to shoot a portrait in which the head and eyes are in a natural and pleasing pose. Red against blue adds so much to your own skill. But the number of times I’ve photographed a bird that has just moved it’s beak, wing, head …. is unbelievable! Oh, I love cardinals. My mother had a ceramic cardinal & a blue jay sitting high up above the wood stove in the kitchen when I was growing up. Blue jays were fairly regular visitors in the boreal forest part of Manitoba, but I rarely saw a cardinal. Thanks for sharing, it’s beautiful. Very pleasing, Mike, and those dried cup looking plant parts make a nice addition to the composition. I love how he stands out on the bare branch! OH that is soo beautiful! A great sight for my morning! Thank you! I’m back again this morning for a second look after seeing him for the first time last night. He’s so beautiful and has a lot of “attitude”. Love the photo! Thank, Liz. I love your comment about the bird’s “attitude.” One of the especially cool things about cardinals is that they stay with us all winter, so there is sometimes a chance to get a photo of one in the snow. They must be great company to cheer you in the winter! I think we are color-starved in the winter, so it is always great to have such a blast of color. Here is a link to a posting about a cardinal in the snow that I did in January of this year (https://michaelqpowell.com/2018/01/06/cardinal-in-the-snow-2/). I’m sure you will enjoy it–it offers an interesting contrast to the blue skies of today’s image. I did enjoy it Mike! What a fiery red bird this is and I just love the colour! Nice Mike! Really stands out against blue sky!